Viv and I decided to make an impromptu visit to Seattle for one night because we needed to do some shopping as well as picking up a bunch of things I had shipped to Goose's house. That also meant we had to hightail it to the border after work on a Friday of a long weekend. Thank goodness for Nexus! 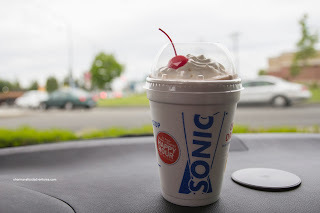 Not having a whole lot of time to eat, we decided to stop by Sonic in Ferndale (as recommended by Yummy Mummy). For those who are not familiar, Sonic is a fast food drive-in with no indoor seating. 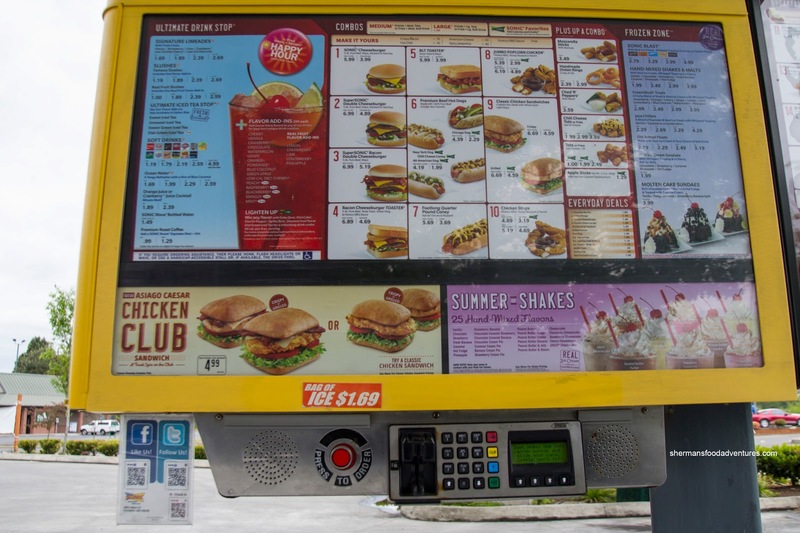 Ordering is done via a speaker and menu at your parking stall. Even credit card processing can be done right in the comfort of your vehicle. We squeezed into the stall which was a tight fit, even for my compact hatchback. This would make Richmond parking spots look spacious! 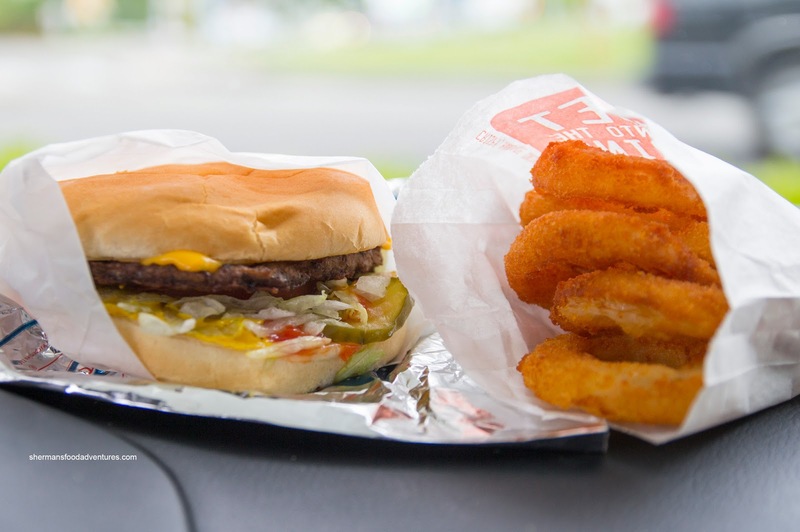 After a quick look at the menu, I decided to get the 1/4 Pound Cheeseburger with a side of Onion Rings. 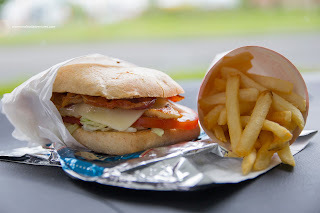 The burger was pretty basic with a soft bun giving way to a somewhat dry patty. However, with all the mayo, ketchup and mustard along with lettuce, pickles and tomato, the whole thing was saucy and messy to eat. Not bad, but I'd gladly take an In-N-Out burger over this one (if they had a closer location than Redding, CA!). The onion rings were coated with a crunchy breading and could've benefited from some seasoning, but they were pretty good. I added a Strawberry Shake as my beverage and it was quite thick and sweet. I liked how they used a lot of ice cream in it. Viv went for the Asiago Chicken Club with Fries and it was pretty average. The bun was a little too soft while the rest of the sandwich was typical, yet curiously bland. The chicken was not too dry though. We liked the fries though as they were hot and crispy. 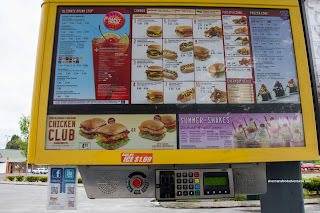 Overall, our visit to Sonic was a neat experience, but not exactly memorable. A few things left me wondering: why are the stalls so narrow and since it is a drive-in, why aren't there tables you hook onto your doors? The experience would've been less awkward in our opinion. Never been to Sonic's. Only Boomers, which is alright. I suspect Boomers is more 'mom & pop" while Sonic is more 'corporate'. Whatever you do, don't go to Win's Drive-In in Fairhaven .... disgusting grease slop. But Fairhaven Fish & Chips (the red double decker bus) has decent eats and F&C. 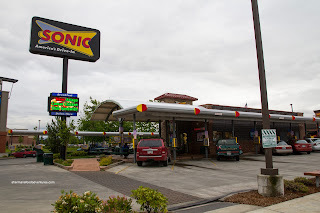 This Sonic is actually in Ferndale, not Bellingham, so it is a tad closer to the border. Thx Brad. Sorry for my poor write-up making it sound like I was comparing drive-ins in B'ham only. 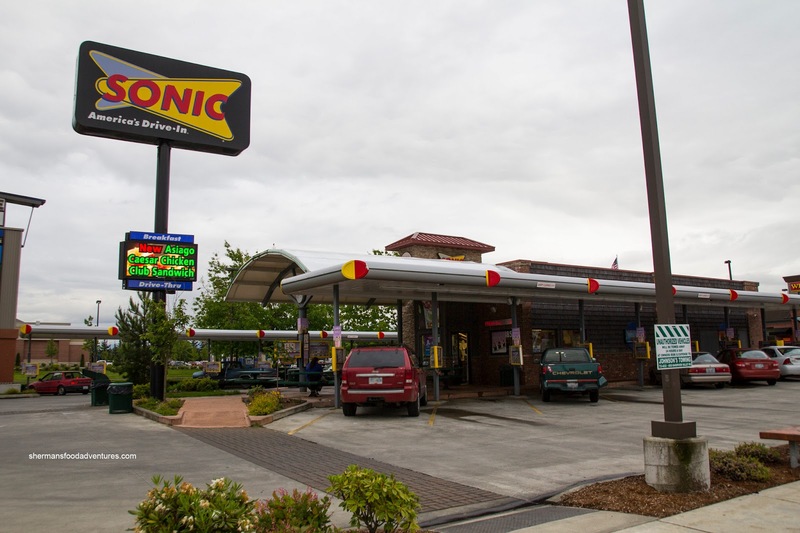 I've only driven by Sonic in Ferndale. But they are a nation-wide chain throughout most states.